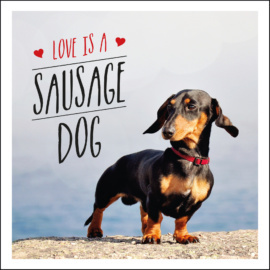 Love is a Sausage Dog, ISBN: 9781849539876 - available from Nationwide Book Distributors Ltd NZ. With a waddle in their step and eyes that will melt your heart, these mischievous little pups have got us head over heels in love. Whether you’ve got one, want one or just think they’re super cute, this little book dedicated to the sausage-shaped dog will prove that it’s not just any old dog who’s a man’s best friend – it’s a dachshund.